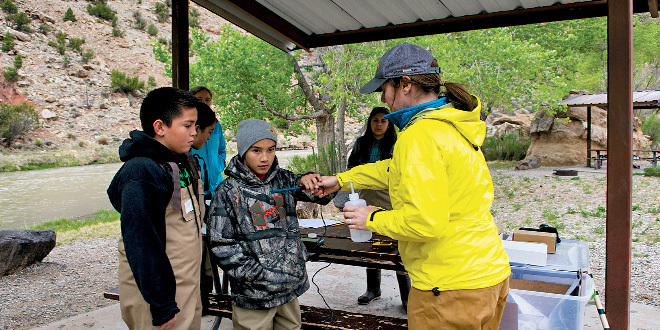 To help students develop a respect for nature, one northern New Mexico program is trying to close the gap between classroom education and outdoor engagement. The New Mexico Wildlife Center in Española is hoping hands-on science activities will develop a generation of youths with a desire to protect the state’s natural resources the way a sow protects her cubs. Above: (right to left) Christy Wall with the New Mexico Wildlife Center works with Cruz Sandoval and Loren Vigil to test water samples pulled from the Rio Chama. The students were asked later what might influence water turbidity, temperature and pH levels. NMDGF photo by Zen Mocarski. The River Classroom Program, developed and managed by the center, started small, but continues to expand and provide a number of programs designed for students ranging from fourth to ninth grade. It was enough to garner the attention of the New Mexico Department of Game and Fish Share with Wildlife program. The New Mexico Wildlife Center has submitted proposals and received funding for wildlife education or rehabilitation activities in at least eight of the last 10 years. “Educational programs like this are an important component of securing the future of New Mexico’s natural resources,” said Ginny Seamster, Share with Wildlife program coordinator. 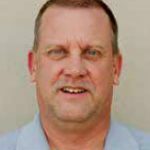 But, with limited staffing and funding, the center’s programs are focused more on quality than quantity. In mid-May, Wall and Katherine Eagleson, executive director at the center, were out with 12 students involved in the Española Gifted and Talented Education Program along the Rio Chama. The students initially were split into groups, some studying water quality by checking turbidity, pH, temperature and dissolved oxygen levels, while others put on waders to venture into calmer areas of the river where they used a net to capture macroinvertebrates from the river bottom. The insects are important indicators of water quality. Later, groups ventured out to look for signs of wildlife and identified both native and non-native vegetation in the area. After each session, students and educators spoke about their observations and examined potential cause-and-effect relationships to account for the data obtained, such as recent rains causing higher turbidity in the river and the higher spring flows accounting for low water temperatures. Wall said the hope would be to help usher in a new generation of stewards that will continue to care for the state’s valuable resources.